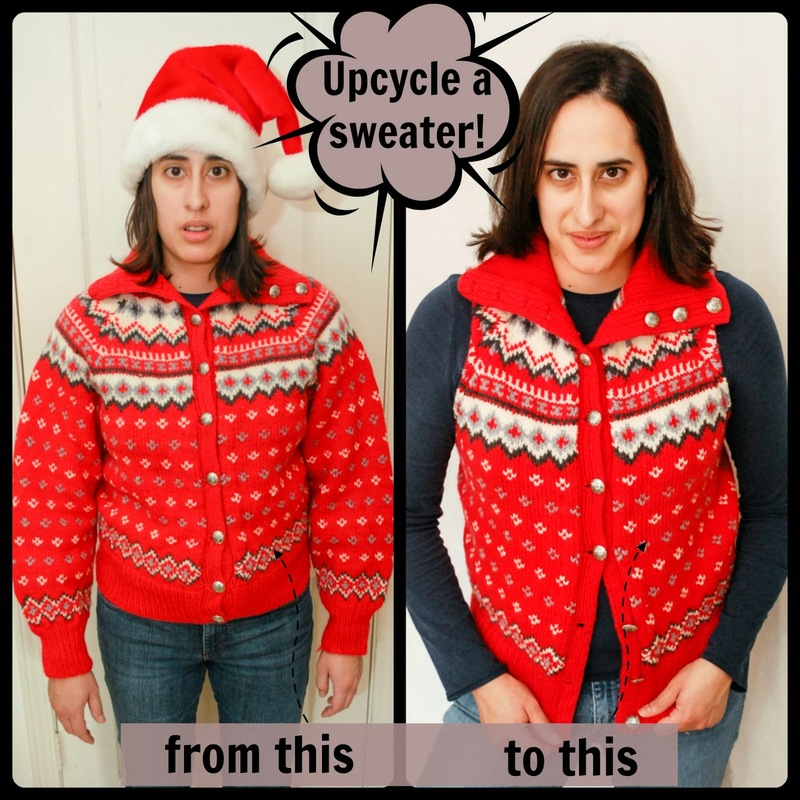 Did you know that upcycling is one of my favorite things to do? You didn't? Well, now you do. I get a great amount of satisfaction in converting an unwanted article of clothing into something new and different. It's just so much fun. 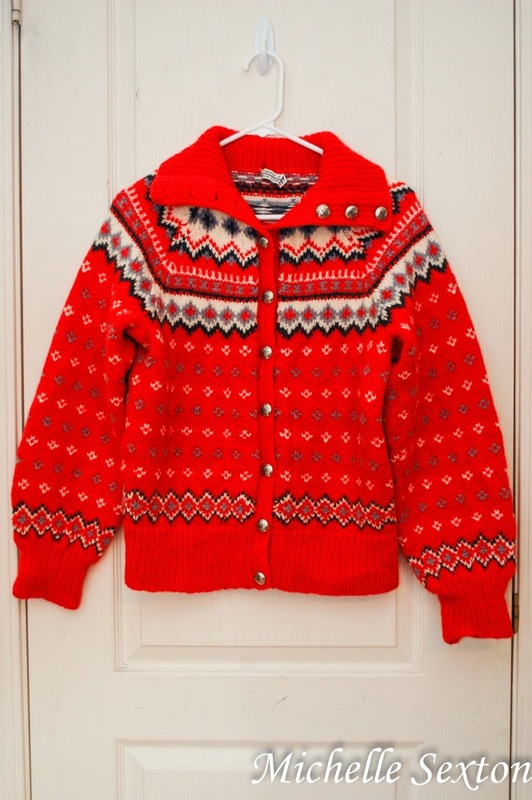 I've had this sweater in the back of my closet for a while, begging to be changed into something else. It needed to be upcycled. 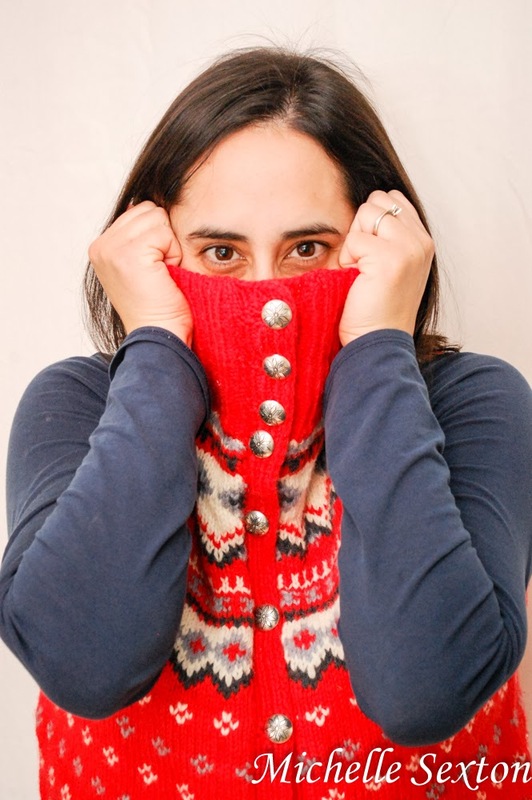 Rest assured, I never actually wore this sweater until after I upcycled it. (I heard those sighs of relief. Yeah.) 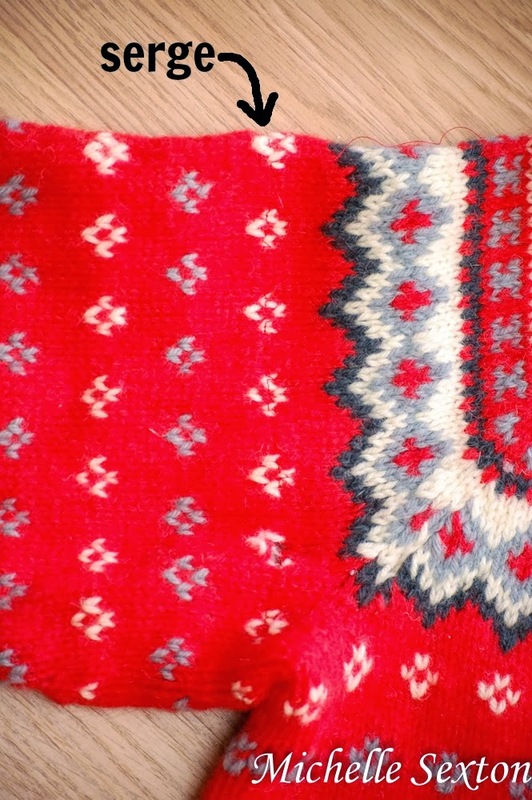 This hand-knit sweater from Norway was truly a diamond in the rough with its Fair Isle pattern, beautifully crafted buttons, and amazing fold-over collar, but it was hard to appreciate it's beauty. 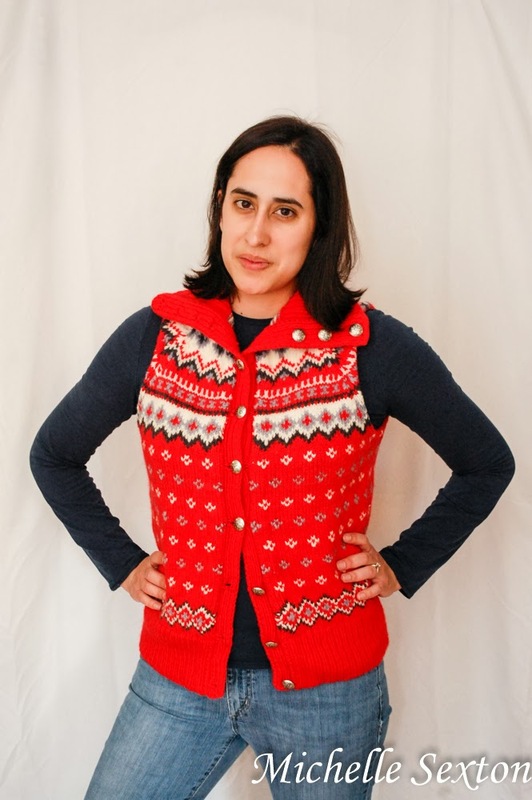 So, I gave this sweater a small make-over and turned it into a sweet sweater vest. When I wear it now, I pretend I live in Maine...because, somehow, Maine seems exotic to a person who has lived in the desert for most of her life. 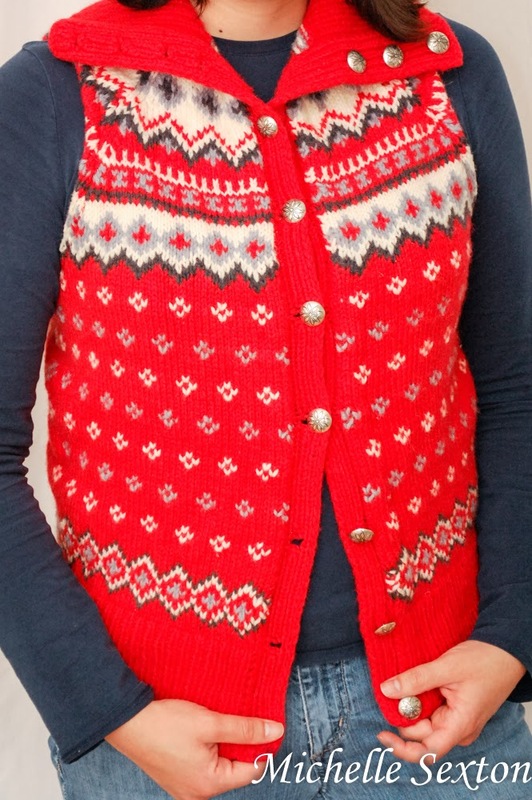 And in my mind, people in Maine wear sweater vests like this. Don't be offended. A closer look at the serged sleeve. Hard to see due to the fact that the thread is also red. 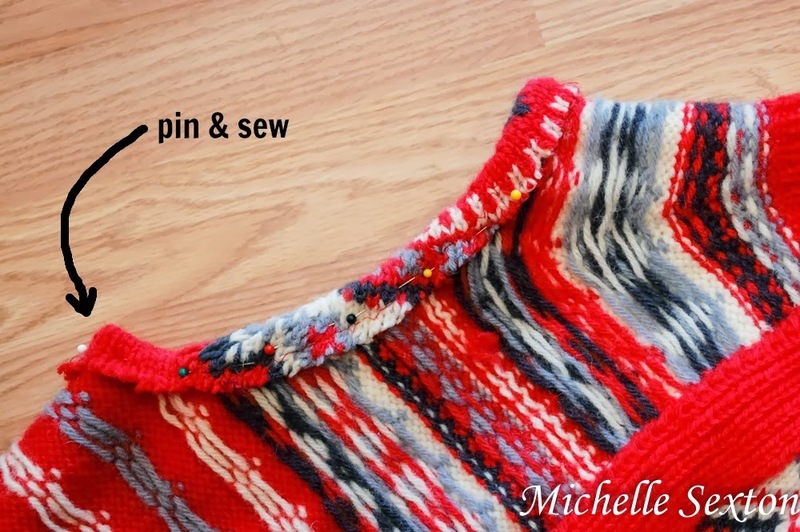 Start out by serging the top and bottom portion of the sleeves in a straight line, just above the armpit (pictured above) to prevent the sweater from unraveling once it's trimmed. 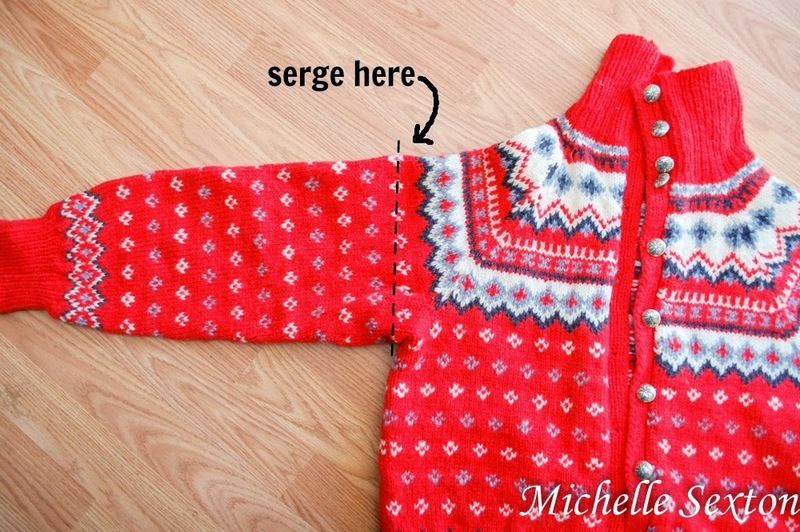 Repeat the serge on the opposite sleeve, as well. 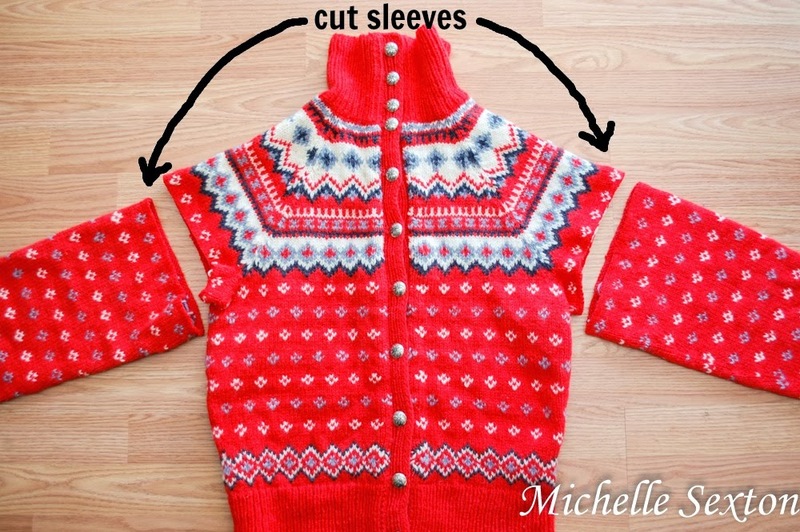 Once the sleeves have been cut off, decide where you would like the top of the vest to end on your shoulder, and mark it. 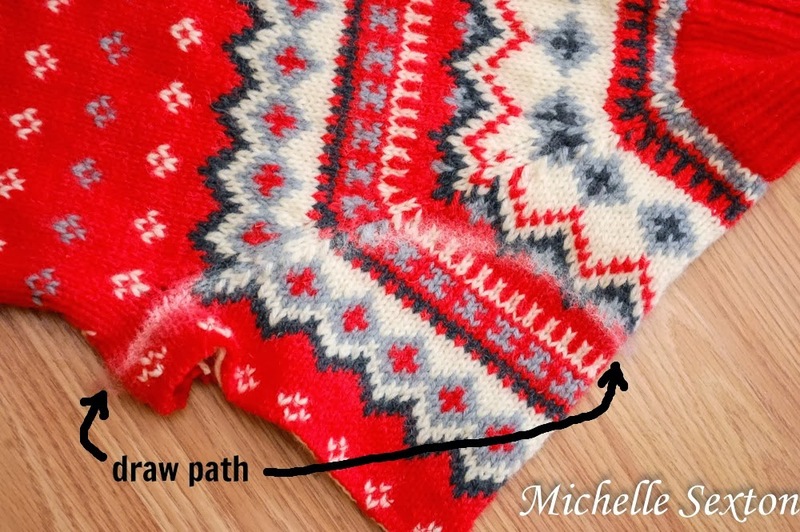 Draw a rounded path on the top portion of the sleeve from the top of the marked shoulder to the bottom near the armpit. 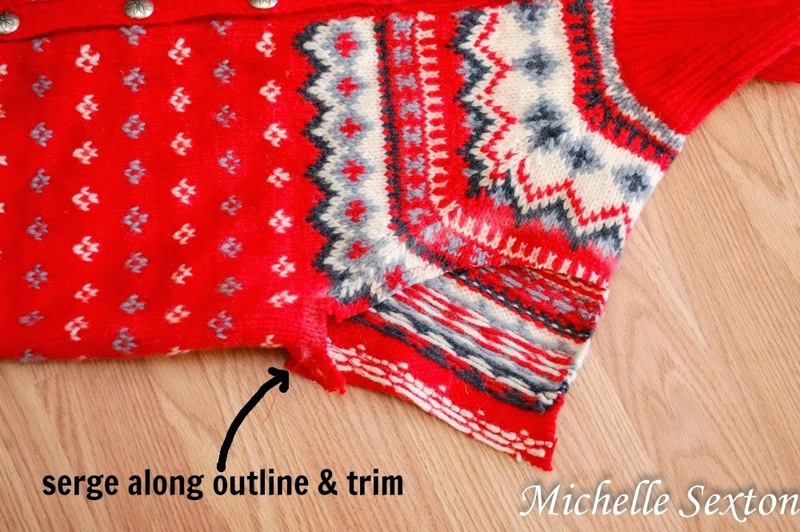 Once the top and bottom of the first side of the sweater have been serged and trimmed, fold the sweater in half and trace the sleeve path onto the top portion of the opposite side of the sweater. Serge the top portion of the sleeve, cut away the excess, retraced the path onto the bottom portion of the sleeve, serge, and trim again. 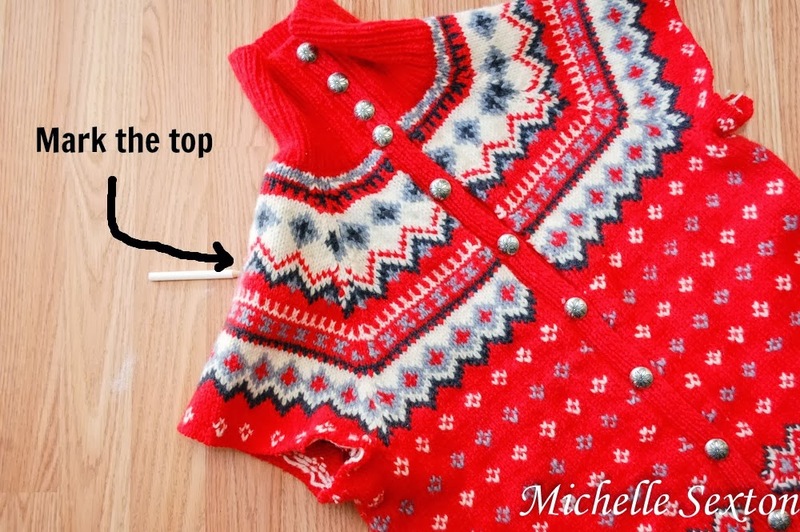 Turn the sweater inside out, pin the raw edges, and sew a straight stitch along the edges. 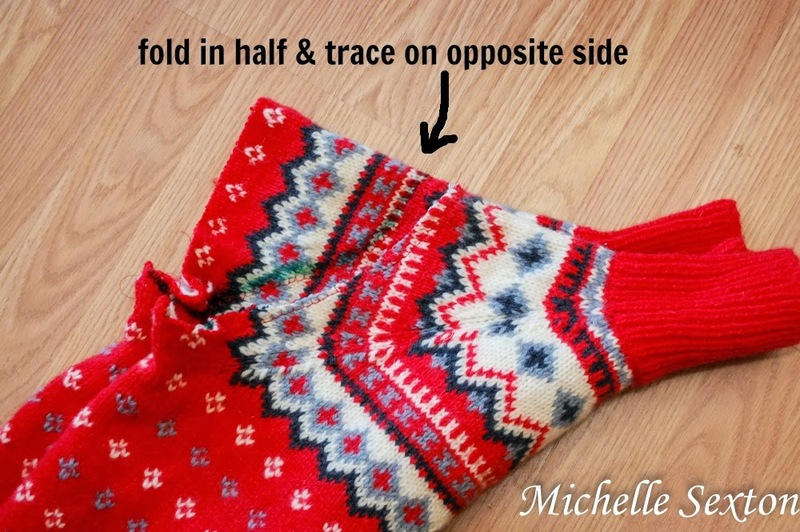 Trim the excess thread, turn inside out, and wear! And look - the collar is still just as awesome as it was before. 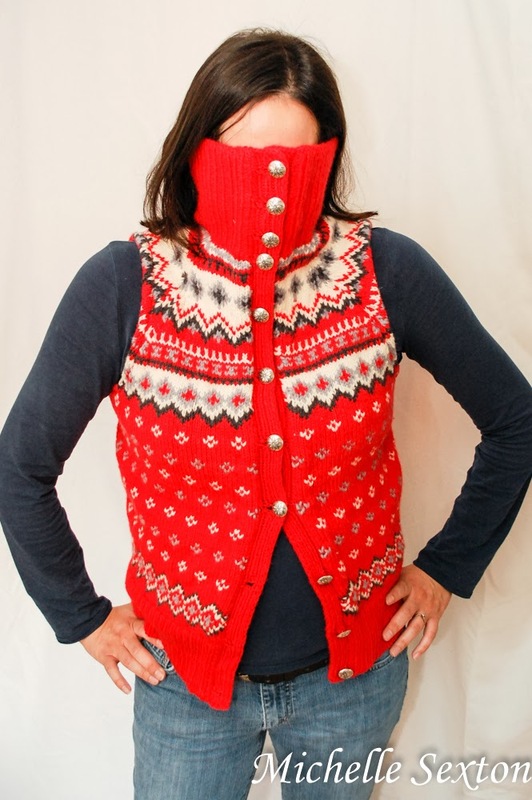 If it gets really cold, I can wear the sweater like this. Will you still be my friend if I wear it like this? ;) Go and make a vest for yourself now! 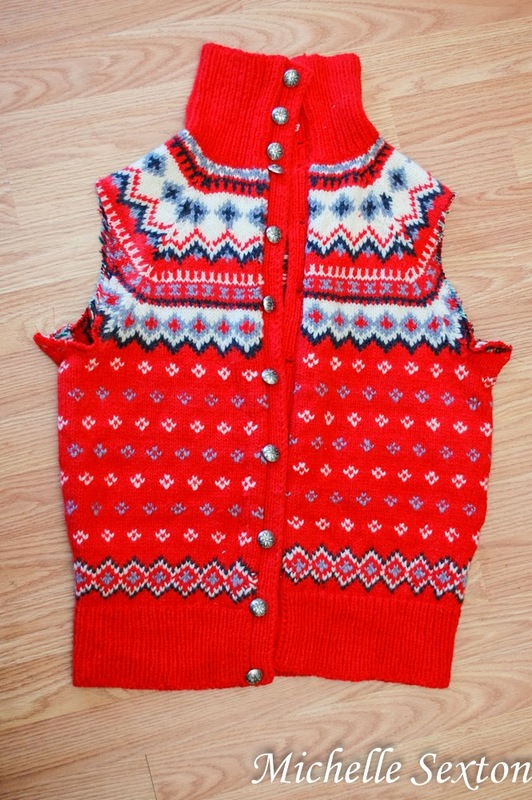 Way to turn a granny sweater into a really cute vest! I think I'll have to brush up my sewing skills and hit the Goodwill.